I wasn't really a fan of hot drinks. I was more than happy with water, squash and fizzy drinks (or pop as I now call it having spent more of my life in Yorkshire than in my southern roots). Until, that is, I went to university. This is where it began. You might think that it was down to lots of late nights and hangovers (and there were some of those) or help to extend study time and give you that extra push to revise some more. In effect it was down to three things. - I wanted to be social. - I couldn't stand the smell, taste or thought of tea. Now I take my coffee strong and black (due to a brief spell dairy free diet to help with my asthma - it didn't so I was soon back to cheese, chocolate and ice cream) and prefer a little of something more expensive than lots of cheap instant stuff. Our best investment was an espresso maker. There's a milk froth attachment for the ABO to have a warm milk added. I'm not an amazing barista so I hesitate to say cappuccino. It's handy for bigR to have a frothy milk too. To start the day, its usually instant coffee. It's quick, easy and necessary whilst I make littleR a bottle and corral bigR into breakfast. Mid morning is my favourite coffee time. If I'm at home I'll fire up the coffee maker. Currently the favourite blend is Taylor's Italian. I also frequent a very well known chain who make delicious coffee and add two shots as standard (rather than other chains which charge you for the extra shot) or three shots should you got for the larger buzz! I like to watch the people come and go. If I'm alone I can be silent in the hubbub. The children are well catered for too. The local independent coffee bar also has delicious coffee but is in no way child/buggy friendly. So now the weather is cooler and we need to be inside I'm back to my trusty chain. Afternoon coffee isnt as frequent these days. It boosts me from my sluggishness. More often than not I need it due to a disturbed night with one of the children or my own galloping thoughts. By far the best thing about our stay in Italy has been the coffee. Coffee bars exist everywhere. They make the most exquisite coffee. I'm a bit of a heathen and have an americano to make the espresso last that moment longer. 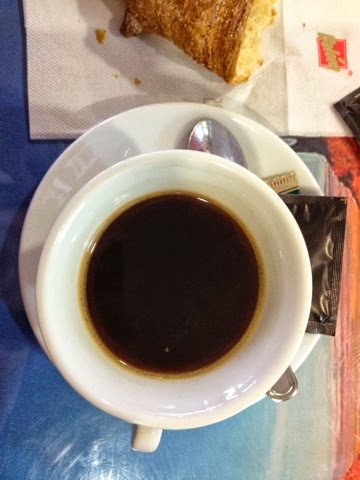 Coffee time in Italy isn't a time to linger. It's a brief moment to recharge with caffeine and perhaps also partake of a brioche (various flavoured croissants- nutella- divine). My coffee love also extends to a love of mugs. You can beat a good mug. The shape, the way it feels full in your hand. That's also part of the coffee experience. Perhaps one day I'll share my mug love too. I love my coffee machine, I love that wonderful comforting smell. Hello - thanks for your lovely comments on my blog. I only usually drink one cup of coffee a day - tea is more my drink - but I love to use my Bialetti stove top coffee pot and enjoy the ritual of making it this way. I can't abide instant coffee. And yes, the right mug is crucial! I was always a cold drink fan growing up - and my fiance still is. I was introduced to 'proper' coffee when I worked at a university but as a mum to a one year old succumb to instant coffee first thing for a much-needed caffeine fix!